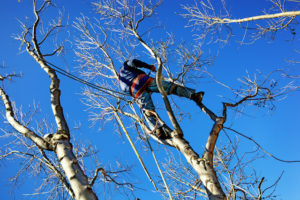 Should You Trim Dead Branches Off of Your Tree? It may seem like you’re losing a lot of your tree at first, but you’ll notice that the new growth coming in is thicker and has a better shape. Regular trimming, or pruning, is extremely beneficial to your trees. It may seem like you’re losing a lot of your tree at first, but you’ll notice that the new growth coming in is thicker and has a better shape. It’s actually a lot like getting a haircut! If you find dead branches on your tree, those need to come off, and here’s why! Removing dead branches is a safety issue. If there is a storm, strong winds, or some other weather event, those branches can come flying off and cause damage to people, property, or other trees. Plus, when the arborist is trimming your trees, they will do a general checkup to assess the overall health of the tree. Pruning is particularly important for young trees, as it aids in their development. Proper trimming helps young trees develop a strong, shapely branch structure. For more mature trees, the pruning will help make the branches less dense. Decreasing the number of branches helps them stay healthy. Water and sunlight can be more evenly distributed. Trimming your trees regularly will help to enhance their natural beauty. It gives them a nice shame and gets rid of the dead parts. What’s left over is full, lush, beautiful branches. Keeping your trees looking their best can also help your property value. Whether you just want to beautify the exterior of your home or you’re trying to sell it, tree trimming benefits your whole property! This entry was posted on Friday, April 13th, 2018 at 1:53 pm. Both comments and pings are currently closed.